Honey: A natural, healthy and very nutritious food. Fir tree: Εxceptional honey made from the honeydew produced by aphids feeding on the Cephalonian fir as well as from the wild herbs of Ainos mountain; it is reddish in colour and quite thick. This honey is rich in minerals, proteins and amino acids and has fewer calories than other honeys. Thyme: this is the famous thyme honey of Cephalonia. It has an intense aroma and is exceptionally tasty. Royal Jelly: Fact or fiction? Royal jelly is the substance that transforms a worker bee into a queen. In humans it helps people that suffer from exhaustion and for women it helps with lactation. It also stimulates the immune system and is therefore good for fending off colds. This product is available fresh, in a 10g jar for a 40-50 day treatment. Pollen: A natural food which is very rich in protein. It contains biologically active ingredients that stimulate the metabolism, control the appetite and reduce fat deposition. It can work alongside the medical treatment of prostatitis. This product is available in 110g, 230g and 460g packages. 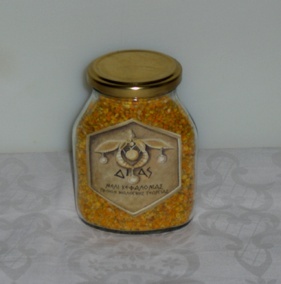 One tablespoon of pollen provides the daily requirement of protein, as well as most vitamins and minerals. 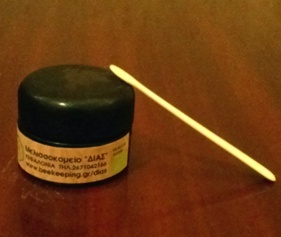 Propolis has a strong antimicrobial and antioxidant action. It is rich in flavones and flavinoids and can be used to treat problems of the stomach such as ulcers. 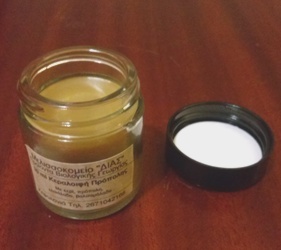 30 ml paste: Propolis-olive oil balsam. Suitable for external use. 20ml solution: 30% propolis in 70% alchohol. 15-20 drops in 10ml of water are good for the mouth and the digestive system. Note: Some of these products are seasonal and often available in small quantities, and are therefore not always available throughout the year. For further information, please do not hesitate to contact us.